LIVE REPORT: umbrella Acoustic Oneman @ Aoyama Future Seven | VKH Press – J-Rock & Visual Kei Coverage Worldwide! Indie band umbrella revealed another dimension to their unique sound at their first acoustic oneman live on June 23rd. The live began with the sound of pouring rain that echoed across the room at Aoyama Future Seven which was illuminated in soft blue light. The members entered the stage one by one, drummer Sho, bassist Hal, guitarist Shu and vocalist Yui. They all took seats lined up side by side on the low stage. 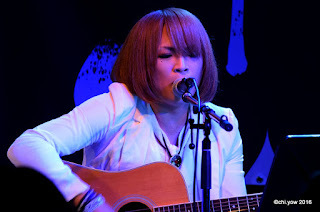 Yui also had an acoustic guitar and Sho had chosen to play a djembe, an instrument not normally seen in visual kei. Once they were settled, they launched into their first song, “Keihaku na Hito”. Red and orange lights lit up the room and Yui’s voice floated over the attentive crowd. The proximity of the band to the crowd made the space feel cozy and enhanced the richness of the acoustics which had no trouble filling the space. They immediately followed with “Kazamidori” which had the room dyed in purple light. It was hard not to be moved by the nostalgic feeling created by the stripped-down instruments and Yui’s simple but emotional vocals. 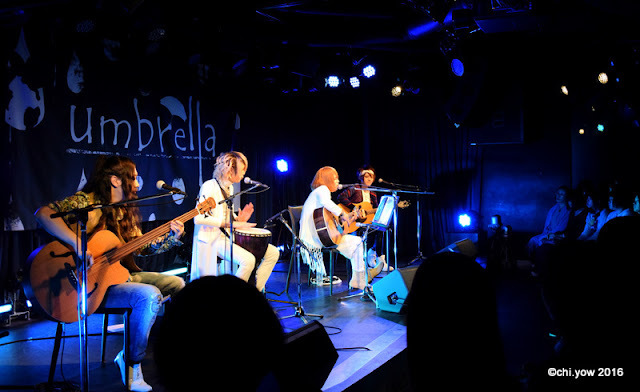 Acoustic proved to be a solid choice in showcasing the band’s technical skills like the next song “Requiem”, which highlighted Hal’s bass playing with a melody that could be heard distinctly throughout. 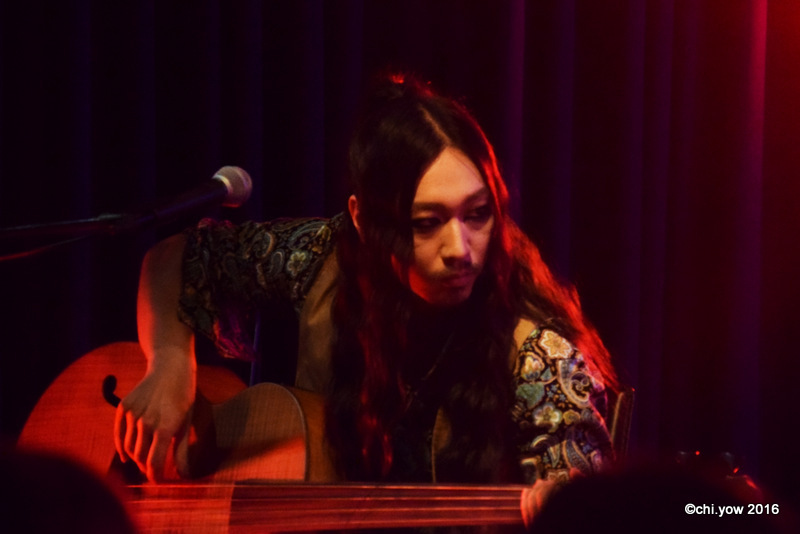 Warm orange lights set the mood for a beautiful acoustic rendition of “Tsuki”. All the members added their voices to the chorus in a performance that was upbeat but still soothing. When it was over, Hal mentioned that they had really wanted to do a live in the Kanto area (being mostly based in Kansai) so they really appreciated that fans showed up. He then called on each of the other members, beginning with Sho, who all expressed their gratitude to the crowd. 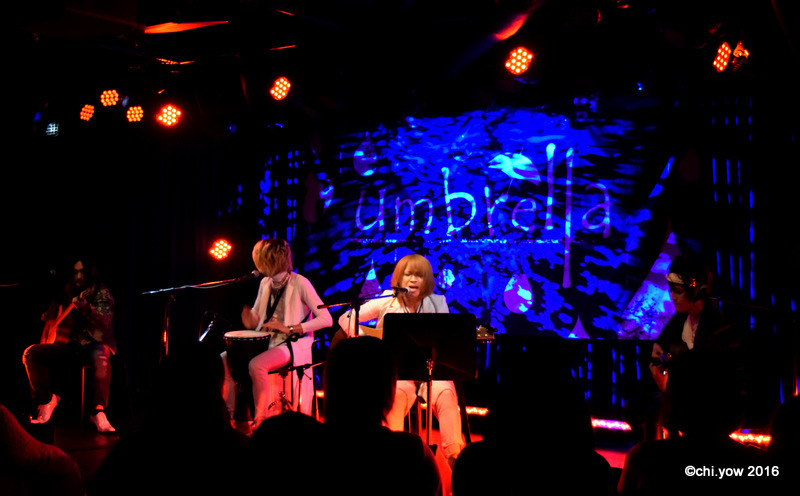 Yui mentioned that rainy season was always fun and it suited their image perfectly. 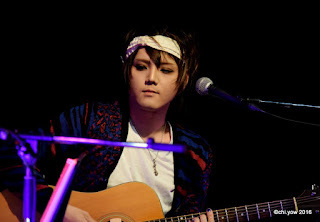 He also jokingly warned the crowd not to fall asleep since the rest of the live was going to be quite long after that. 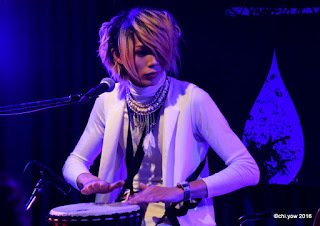 Red lights and a catchy drum beat pulled the audience into the next song, “Hi “Jo” Kaidan” which was reminiscent of a relaxed jam session as the members played side by side. The upbeat vibe of the song had the room swaying along. “Bokutachi ga Egaita Panorama” was reminiscent of comfortable rainy nights with the pronounced bassline and emotional vocals. Yui managed to sound almost on the verge of tears yet his voice never cracked or wavered. 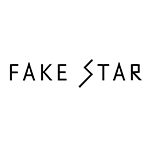 It was clear that the band tailored their music to fit their name perfectly. 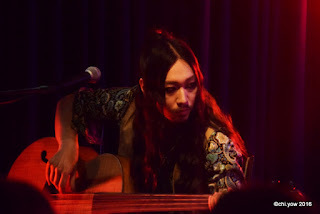 The instruments were the highlight of “Wasurenagusa”, which started with an easy four chord guitar progression that became layered with the deep thrum of Hal’s bass and then the staccato of the drums. This performance made it evident how tricky it must have been to translate the complex beats of an entire drum set to a single djembe but that’s exactly what Sho did.The music continued to build in intensity during the song, leading into Shu’s guitar solo. The set flowed seamlessly into “Ito.” and then “Binetsu”. 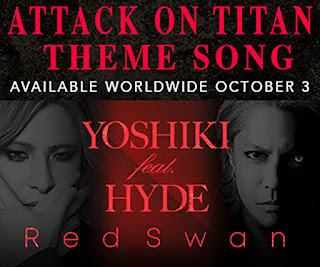 “Binetsu” started with just the guitars and vocals. The spotlight was on Shu as he played the intro and then Yui chimed in, his voice whisper soft, floating through the room. Eventually they were joined by the bass and the drums, pushing the pace forward. Once the crowd assured him that they were definitely awake, he talked a bit about when he was growing up in the countryside of Kyoto. He would often take his guitar and play it in the fields. As random as that memory was, he confessed that being able to play before a crowd now made him extremely happy. 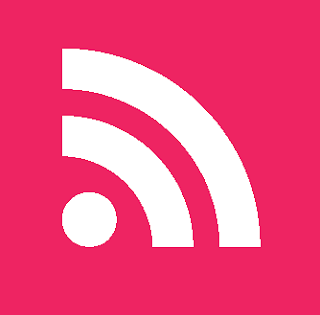 The rest of the band then took time to talk frankly about their feelings and hopes for the band. Sho was asked what his goal for the band was this year and he shyly admitted that he simply wanted to see more people listening to their music. The other members chimed in then, saying that even though Sho is not too great at speaking in front of crowds, he has the kindest heart of any person that they’ve ever known. Hal said that when he thinks about what kind of band they want to be, just like Sho said, most importantly he really wants more people to hear their music. Yui talked honestly about pursuing music and how the more time he spent on music, the more time it took away from him participating in “normal” life and doing things like getting married or having kids. Being the only child, he wants to at least show his parents a good side of him through their music and of course, to make the fans happy. With that, he asked that they keep supporting umbrella, to which the audience gathered there readily agreed. 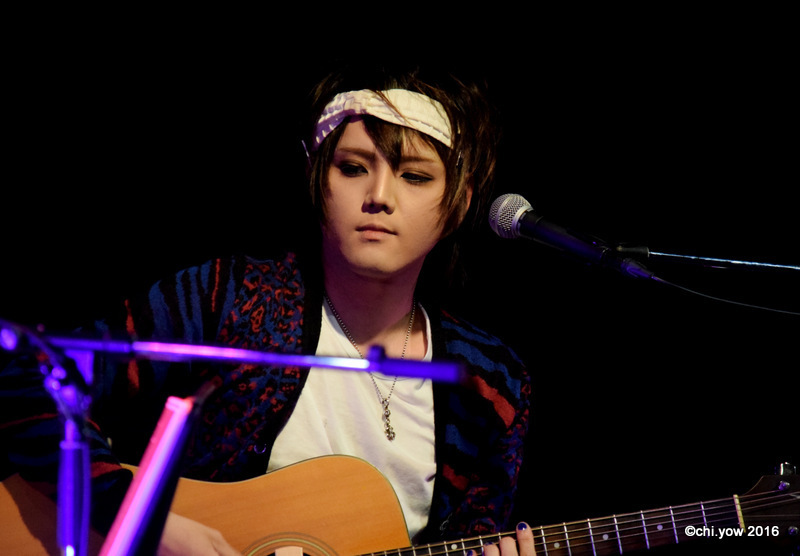 Moving on with the show, they performed “Zoukei Alice” which opened with a clear, melodic guitar melody from Shu. The room was illuminated with blue and purple lights, the same colors as the hydrangeas during the rainy season. It ended and the room went completely dark, followed by flashing blue, green and white lights for “Toumei” which had a catchy rhythm. They followed with “Skyfish” and at the end, Yui thanked everyone again. The last song “Alain” was light and happy. The rest of the band sang backup and it was impossible not to get swept up in the contagious good feeling. Yui urged the crowd to sing too, since it was the last song, and soon the whole room had joined in. When it was over, the band all thanked the crowd and left. Of course, their fans would not let them go that easily and they began to petition for an encore. The band returned and Hal thanked the crowd sincerely. They did a quick call and response with the crowd and then Hal said that Yui had to pick the final song. Yui thought about it and decided that since it was their first live of the month, they had to do “that” song, which turned out to be “Tsuki”. 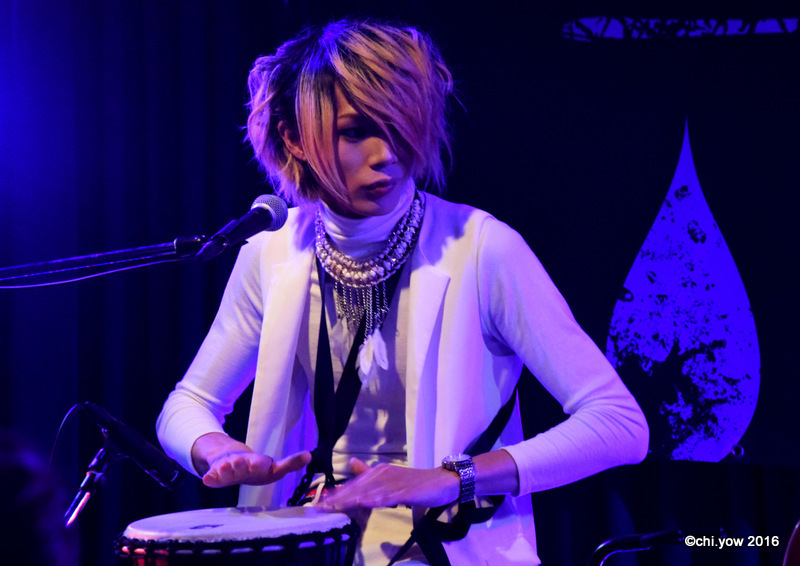 Beginning with Sho’s drums, the rest of the band joined in the gentle melody as the crowd sang along. Thank you to umbrella and staff for this opportunity!